The cards describe in words and line drawings what it is like to live in Advanced Dementia and other terminal illnesses—for you and your loved ones. 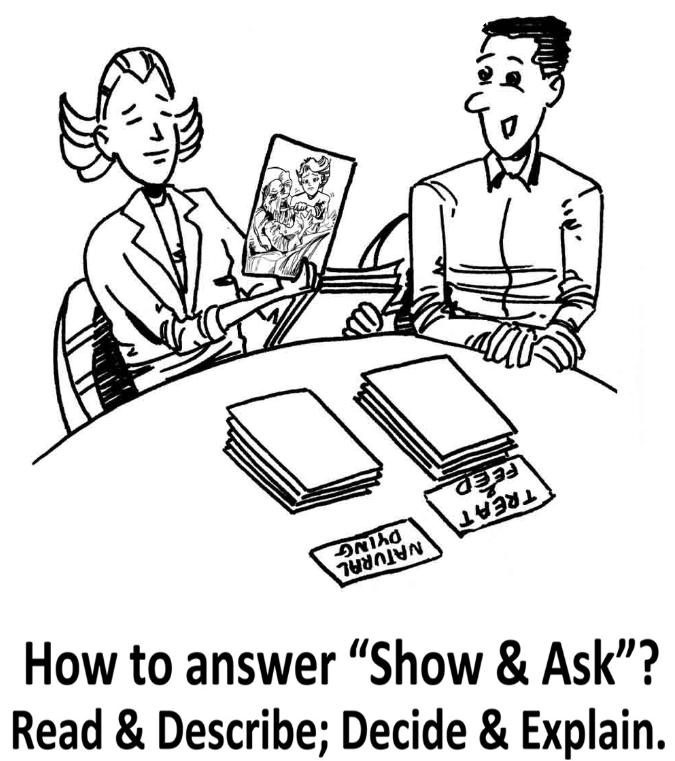 EASY: Sorting Natural Dying cards is EASY: Make one treatment decision at a time. Illustrated cards describe conditions using almost no medical jargon. Consider the condition and judge what treatment you do, or do not want. Then memorialize your choices in your Natural Dying–Living Will. Effective: To avoid conflict, use a clear and specific Living Will combined with a video of yourself where you explain your wishes clearly and convincingly. Avoid vague Living Wills that may prolong suffering. Until resolved, conflicts may result in To Delay is To Deny. Safe: As many as four out of five physicians may unintentionally misinterpret Living Wills as DNR orders. Patients who are critically ill and who want CPR, may therefore not receive it–unless they add clear instructions in their Living Wills. Why sort Natural Dying cards a second time? Think again after reflection and discussion with others. Prove your decisions are mostly consistent over time. Both may prevent future challenges that claim you might have not really known what you were deciding, or that you have since changed your mind. Can you change your mind? Yes, as long as you possess mental capacity to make end-of-life treatment decisions. What might change? Your diagnosis; getting older: further reflection on your goals of treatment; a change of relationships; and further direct experience, reading or discussions with others. Highly recommended: Review and update your decisions about one year later. As a Caring Advocates member, you can revise and submit your choices any time, for your “UPDATED FINAL” Natural Dying—Living Will. Important: When you sort the cards, you will be asked to indicate how strictly you want your future proxy/agent and your treating physician to follow the wishes you expressed. How to submit your choices so you receive your Natural Dying Living Will. 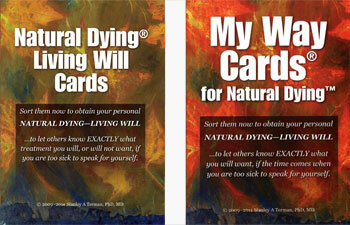 Would you like more information regarding the differences between My Way Cards and Natural Dying Living Will Cards? My Way Cards are for those who wish to prioritize their autonomous right to self-determination. Each version has its own set of introductory cards. 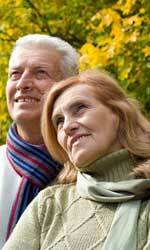 For both, the 48 conditions described and the treatment options offered are the same. If you would like more detailed information, read this short article. What if you are asked to make a decision for an Advanced Dementia patient who does not have a clear and specific Living Will? Consider: “Consensus for Substituted Judgment (Now Care Planning)”—a new, unique way to make treatment decisions. (B) Minimize surrogate decision–makers’ stress. Points to consider as you select a My Choice Card. All the points below are worthy of your consideration even if you know now that your final decision is likely to be between My Choice Card C and D. In addition to reading about or listening to these points, we recommend you discuss these options, along with your values and goals, with your proxies/agents and loved ones. My Choice Card A states another person should always try hard to provide hand-feeding and drinking. Why do people select “A”? Here are some examples: Some want to live as long as possible—regardless of how much they may be suffering themselves or have become a burden to others. They may feel life is always precious or they may be afraid of dying. Many others want to faithfully follow their religion’s teachings that their advisors interpret as making Choice “A” morally obligatory. Caring Advocates agrees entirely with the “specific approach.” We recommend you complete a Living Will that states your wishes in a clear and specific way and that defines your proxy/agent’s role as only to make sure others honor your Known Wishes, rather than to make decisions for you. Caring Advocates goes one significant step further than National Right to Life and Robert Powell Center: We help you set up a strategy designed to compel others to honor your wishes. While the majority of people who use the Natural Dying Cards want to make sure their dying is not prolonged, it may turn out that using Natural Dying Cards plus selecting My Choice Card A and other strategies is the most effective way to make sure patients are never denied food and fluid—if that is what they want. My Choice Card B lets your proxy/agent make all final treatment decisions for you. This selection can be appropriate for patients who are members of certain cultures or religions where for example, the tradition is that designated elders make end-of-life decisions on behalf of patients. Selecting “B” is also appropriate for those who prefer not to think about dying and not to think about make life-determining decisions. Some may prefer to select proxies/agents based on their greater experience and knowledge… and hope they will make better decisions than they could themselves. Still others feel they cannot predict the future, and would rather trust others to make these irreversible decisions contemporaneously. In such cases, the preferences that patients previously indicated by sorting Natural Dying Cards can still serve to guide their proxies/agents. Selecting My Choice Card B is appropriate for individuals only if they do not feel even one of the 48 conditions would definitely be “Treat & Feed” or would be “Natural Dying.” They must be willing to trust the final decision about every condition to their proxies/agents. Also, they must make sure they can trust more than one person—just in case their first choice proxy/agent is not willing, not available, or not capable of making these decisions when the time comes. Otherwise at worst, a court may appoint a guardian or conservator who doesn’t know the patient well. Regarding their proxies/agents: the responsibility placed on them could create an extra emotional burden compared to patients who make decisions themselves for the majority of these 48 conditions. This is an instruction in some—actually, in a minority—of Living Wills, which states how strictly the person wants others to follow the instructions in that Living Will. Example: Grant my proxy/agent complete general leeway so that she can decide to continue life-sustaining treatments if I can expect another grandchild soon (or a similar event), or if a new experimental treatment just became available—even if I meet my own criteria to forgo all life-sustaining treatment. Both My Choice Cards C and D divide treatment decisions into three categories; two categories have zero leeway and one has 100%: “Treat & Feed” and “Natural Dying” have zero leeway, which makes your decisions irrevocable for those conditions. The other category is “Consider Natural Dying,” which makes leeway 100%. “D” seems appropriate to people who realize that near the end of their lives, Advanced Dementia patients will lack capacity so they will no longer really have a mind that can change; that is, they will no longer understand or appreciate the consequences of asking for food and fluid to be put into their mouths, which may increase and prolong pain and suffering and continue being a burden to others, while they receive little, if any benefit. Unfortunately, pain and suffering are likely to increase more as dying is prolonged if physicians fail (and they often do) to recognize their pain and suffering. Some people realize that Advanced Dementia patients’ requests for food and fluid may only be an act of habit or curiosity. Their minds cannot weigh the mild degree of pleasure from tasting puree food versus the possible harm and burdens. Finally, selecting My Choice Card D makes the “Ironclad Strategy” more powerful because this logic can apply: If patients were so certain they wanted the goal of a timely and peaceful transition that they disqualified their “future demented self” from being able to sabotage their plan for Natural Dying, then they would clearly not permit anyone else—no matter how well meaning or closely related they are—to have the power to sabotage their plan. Also, regardless of what you decide, know that you can always change your mind—as long as you have capacity. From time to time, people ask us to send them a copy of our Natural Dying—Living Will. It is the only Living Will we know that is designed to legally overcome the “No Plug To Pull” challenge, that many Advanced Dementia patients present. Unlike most Living Wills, you do NOT complete the form with a pen or on a computer. Instead, you use an illustrated decision aid tool that presents 48 different conditions for you to make “one decision at a time.” Typically, this takes between one-half and one hour as you go through the items (on cards) twice. This is how you decide if you want to consider Natural Dying “along with other items” versus “by itself” as opposed to receiving all treatment to live as long as possible. While the Natural Dying—Living Will includes some built-in strategies to compel physicians to honor your wishes, the professional team at Caring Advocates (which includes attorneys and pastoral counselors as well as bioethicists and clinicians) believe it is also necessary to complete other strategic forms and videos—which are included in the Caring Advocates’ Living Will Planning Package(click here). These are the reasons why the Natural Dying—Living Will is not just a form that can be sent out. View the FREE video, “The BEST WAY to Say Goodbye if living with end-of-life pain or Advanced Dementia. How to live longer.” The link is: youtu.be/mzKemFqeJdE. 1. Repeat the three-way sorting in about a month—to show consistency and/or further reflection. 3. Do the recording with either your proxy/agent or a Caring Advocates Certified Planning Professional. A professional is recommended for patients who have a diagnosis that affects thinking, memory, mood, or judgment; or who are taking strong medications for pain. You can be interviewed anywhere in the world by InterviewByInternet.com. What is it like to be interviewed? I am very impressed with what Dr. Terman has been doing at both a practical and theoretical level (an outstanding mix of the two) to improve the lives and control of people with dementia. –Dr. Tony Hope, founder and Director, Oxford University's Ethox Centre; leader of Nufﬁeld Council's report, "Dementia: Ethical Issues"